Cameron Wesley Janssen (born April 15, 1984) is an American professional ice hockey player who retired from playing for the Nottingham Panthers of the Elite Ice Hockey League (EIHL) on August 12, 2016. The New Jersey Devils drafted him 117th overall in the fourth round of the 2002 NHL Entry Draft. Janssen was regarded as an enforcer. Janssen grew up in the St. Louis suburb of Eureka, Missouri, where he attended Eureka High School for three years. During his sophomore and junior years of high school, Janssen played for the St. Louis Sting of the Junior A North American Hockey League. In 2001, Janssen was selected in the third round of the Ontario Hockey League draft by the Windsor Spitfires. Instead of completing his senior year at Eureka High School, Janssen moved to Windsor, Ontario to begin his first season with the Spitfires. After one season in Ontario, Janssen was drafted by the New Jersey Devils as the 117th overall pick during the fourth round 2002 NHL Entry Draft. During the 2003–04 OHL season, Janssen joined the Guelph Storm, where he participated in the Memorial Cup tournament. Jansen made his NHL debut against the Rangers on November 5, 2005. In his rookie NHL season, Janssen led the Devils with eleven fighting majors. On February 24, 2007, he scored his first career NHL goal against the Washington Capitals at 10:33 in the second period in his 82nd NHL game. Janssen in 2011 with the Blues. In the second period of a regular season game against the Toronto Maple Leafs on March 2, 2007, Janssen knocked-out Toronto defenseman Tomáš Kaberle unconscious with a late hit to the head. Kaberle was carried off the ice on a stretcher. The NHL announced Janssen would be suspended for three games without pay for the incident, forfeiting $7,220.16. In an interview, Kaberle mentioned Janssen had not contacted him for reconciliation, and went on to say, "I don't care [to hear from him]. He doesn't respect me and I don't respect him." On March 30, 2007, Janssen injured his shoulder in a fight with Riley Cote of the Philadelphia Flyers and missed 4 games. He returned for the playoffs against the Tampa Bay Lightning. Janssen was injured in the 2007 NHL preseason as well, suffering an injury in a fight with Jesse Boulerice. On February 26, 2008, Janssen was traded by the Devils to his hometown team, the St. Louis Blues, for defenseman Bryce Salvador. He made his Blues' debut two days later, wearing #55 against the Phoenix Coyotes. 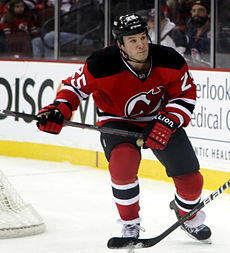 A free agent after his contract with the St. Louis Blues expired in 2011, Janssen signed a one-year, two-way contract with the Devils on July 14, 2011 becoming the 22nd player to be re-acquired and play for the team. Janssen signed as a free agent on a one-year contract with the Nottingham Panthers of the EIHL on August 15, 2015. In July 2012, Janssen appeared on an internet-based radio show called "The Thom and Jeff Show" and subsequently delivered a profanity-laced interview in which he made several controversial comments, including one about gay players. Janssen later issued an apology for the incident, noting that he had "used poor judgment during the course of the show" and saying "moving forward, I hope to eliminate that type of language from my vocabulary. I would also like to take this chance to express my support for the work the You Can Play project is doing, and for the gay community in general." ^ "Spotlight on Cam Janssen". insidestl.com. 2011-12-01. Retrieved 2011-12-20. ^ "Memorial Cup archives". Columbia Tribune. 2008-02-29. Archived from the original on 2014-02-23. Retrieved 2013-01-02. ^ New Jersey Devils 2007-2008 Media Guid. p. 52. ^ "ESPN.com - NHL - Toronto defenseman Kaberle leaves game on stretcher". ESPN. Retrieved 2007-03-02. ^ "Kaberle hopes to return this season". TSN.ca. 2007-03-07. Archived from the original on 2007-09-29. Retrieved 2013-06-24. ^ "Janssen injures shoulder". Fire & Ice. 2007. Archived from the original on 2007-11-14. Retrieved 2007-12-18. ^ "Blues acquire Cam Janssen for Salvador". St. Louis Blues. 2008-02-26. Retrieved 2010-08-24. ^ Chere, Rich (July 14, 2011). "Devils sign right winger Cam Janssen". The Star-Ledger. NJ.com. Retrieved July 14, 2011. ^ Official Game Program of the 2012 Stanley Cup Final. p. 62. This page is based on the Wikipedia article Cam Janssen; it is used under the Creative Commons Attribution-ShareAlike 3.0 Unported License (CC-BY-SA). You may redistribute it, verbatim or modified, providing that you comply with the terms of the CC-BY-SA.